This article discusses The Third Nonprofit Social Network Benchmark Report published by NTEN, Common Knowledge, and Blackbaud You can read my report on The Convio Online Marketing Nonprofit Benchmark Index™ Study here. Both of these reports pull from organizations that have a relationship with Convio, Blackbaud or NTEN and they already have some meaningful technology involvement. So the highlights of the reports that I include don’t include percentages like “percent of nonprofits on Facebook” because in this regard it is a skewed sample. When you get past that, there is a lot to learn from these statistics about organizations who have already gotten their feet wet using social networks such as Facebook and YouTube. 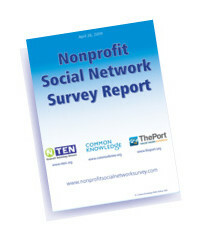 Facebook is by far the most popular social network tool being used by nonprofits and continues to grow. The number of fans on Facebook is growing as nonprofits focus more attention on it, but it is not a good source of fundraising. There is a considerable difference between creating a “casual” presence on Facebook and growing a viable program with a connection to a large audience and scalable results. This shows up in the statistical correlations between size of the community and staff and budget dedicated to it. Participation in Twitter and LinkedIn is lower and has leveled off. YouTube continues to be popular. I noticed at the NTEN national technology conference held this month in Washington, DC that there was a great interest among small nonprofits in YouTube and the whole Google for Nonprofits line. Google sponsored a long workshop and had a well manned booth for the entire conference and YouTube was definitely on the minds of the many visitors to check it all out. Small new donor-empowered peer-to-peer giving sites CrowdRise, FirstGiving, Razoo and Causes all made a very small appearance in the study but they are on the map and worth watching. Who know who may take off and be the best new thing. I am always asked about what is the right amount of staff time to budget for social networking and this report provided the clearest answer I have ever seen about what organizations with established social networks do. Over 60% of respondents say they allocate ¼ of a full time staff equivalent to it. Amazingly almost half the respondents allocate no – that’s right – zero, nothing, nada – budget for it. I can’t imagine any other activity that an organization was willing to dedicate 25% of an employee’s time without any supporting budget. It seems to me that unless you have a tech savvy, communications savvy, super dedicated overall dynamo on this you really should have some budget. How about fundraising? 98% – that’s right again – do not use a social network for fundraising (52%) or have raised under $10,000 with it (48%). This was no surprise to me but it would be to the people who come to my social networking for nonprofits workshop who have fundraising in mind as a top goal. It is always good to have information to benchmark ourselves against. Here are some important takeaways I have from this report. Whether large or small, many nonprofits are using social networking as an important tool today. They are using it for marketing and building relationships with their communities. They are also making strides in using social networking for education, advocacy, and program delivery. If you haven’t been using social networks, or you haven’t done so effectively, it may be time to invest – time and money – to get up and running. Social networking has become a good investment for those making a reasonable effort.